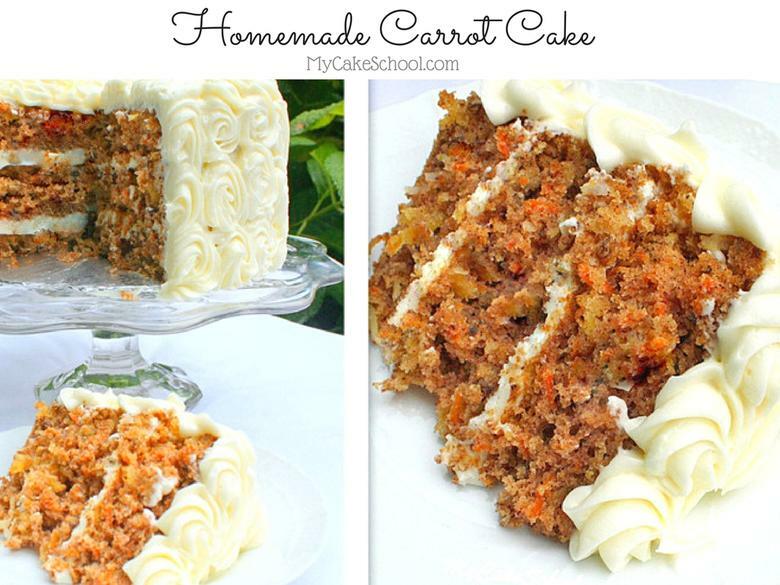 If you are looking for the BEST Carrot Cake Recipe, this is the one! Truly, this legendary carrot cake is my favorite dessert of all time, and it’s the only carrot cake recipe you will ever need. Over the years, we’ve received a flood of rave reviews on this cake, making it one of the most popular on our site! I love cakes with lots of “stuff”… cakes with a wonderful mix of textures and flavors, whether bits of fruit or coconut or pecans, etc. For instance, good old fashioned Hummingbird Cake, Italian Cream Cake , German Chocolate Cake and Apple Spice Cake are close to the top of my list, but Carrot Cake is king! (I feel like I should put that on a t-shirt). What makes THIS scratch Carrot Cake Recipe the BEST EVER? Let’s talk about the parade of ingredients that make this scratch Carrot Cake recipe SO amazing. Of course, carrots and spices are a given, but this favorite carrot cake recipe of ours also includes crushed pineapple, pecans, and coconut. Not all carrot cakes call for coconut and pineapple, or even nuts, but after trying this recipe, we could never go back! These ingredients make all the difference, and are the reason that everyone who tries a slice immediately falls in love (with the cake…and probably the baker too). The added flavor and sweetness are the perfect complement to the carrots, spices, and pecans. Just look at this slice- so much texture and lumpity bumpity goodness! Without question, this is the BEST Carrot Cake recipe on the planet (if we do say so ourselves). I know I’m gushing, but it’s just so darn delicious. As a child I avoided carrot cake in favor of pretty much any other dessert option at family celebrations. I mean, carrots? In a cake? The name alone just sounded a bit too healthy for me. Though we don’t see carrots in many desserts, it actually makes perfect sense in terms of the sweetness factor. Here’s a little carrot cake history for you- Even in medieval times, carrot puddings were hugely popular due to their natural sweetness. The carrot cakes that we know and love today are believed to have evolved from these flavorful carrot puddings. That natural sweetness also explains the resurgence of carrot based desserts during World War II when sugar was rationed. Fast forward to the 1960s and 1970s and carrot cakes began to enjoy widespread popularity in the US not only for their amazing flavor, but also (hee hee) because it’s healthy. Okay, so carrot cake as a health food may be a bit of a stretch, but the idea really makes it easier for me to cut myself a giant slab of cake! Mmmmmm. Because, you never know. Every Good Carrot Cake Needs Cream Cheese Frosting! Finally, let’s get down to the business of cream cheese frosting. After all, carrot cake just wouldn’t be carrot cake without a luscious cream cheese frosting. The cream cheese frosting included in our recipe is our Cream Cheese Buttercream Frosting recipe from our recipes section. We also love our heavenly Pipeable Cream Cheese Frosting if you prefer a thicker consistency. Sandwich the cream cheese frosting between your carrot cake layers, and then finish it off with a generous slathering. I just cannot tell you how amazing this carrot cake is–you just have to try it for yourself. The carrots, pineapple, coconut, nuts, and spices all balance each other perfectly. This cake is ultra moist, and guaranteed to please any crowd! 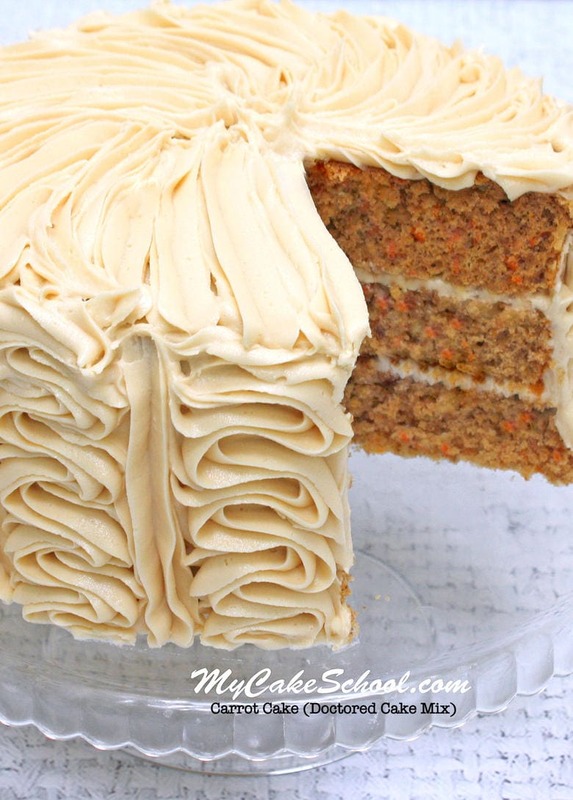 We’ve made countless variations of carrot cake over the years, but THIS is our favorite! Nothing else compares! 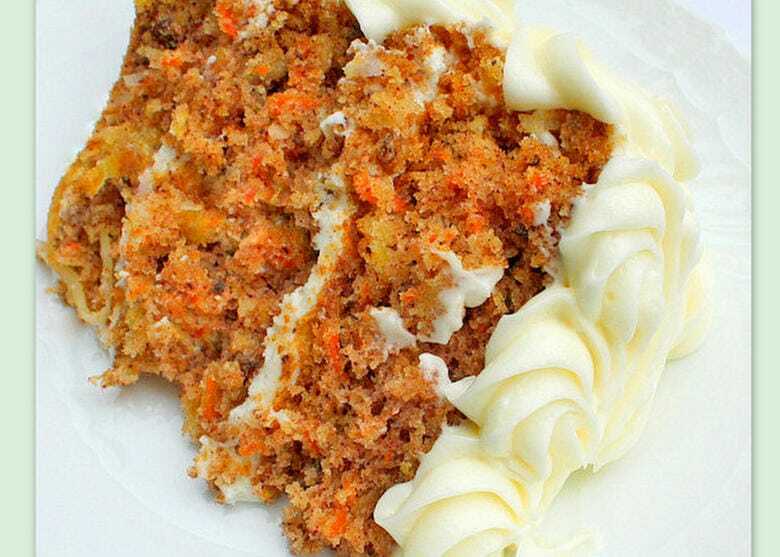 *Although this scratch Carrot Cake recipe is our absolute favorite, we also have a fantastic doctored cake mix Carrot Cake recipe for those of you who prefer recipes based on cake mix. You can find it at the bottom of this post! As I mentioned above, we have a great “almost homemade” doctored cake mix version of Carrot Cake that’s a keeper! Convenient, consistent, and with many of the same ingredients as our scratch version. You can find it here! 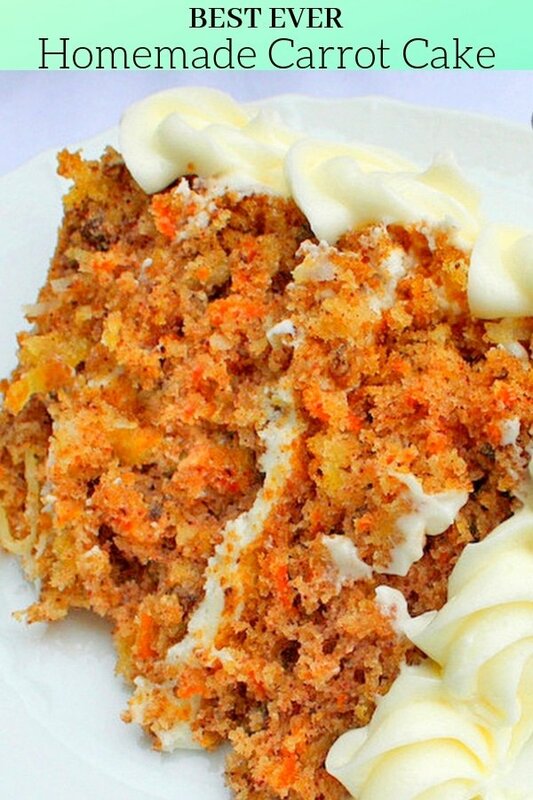 : Carrot Cake: A Doctored Cake Mix Recipe. Thanks for stopping by! 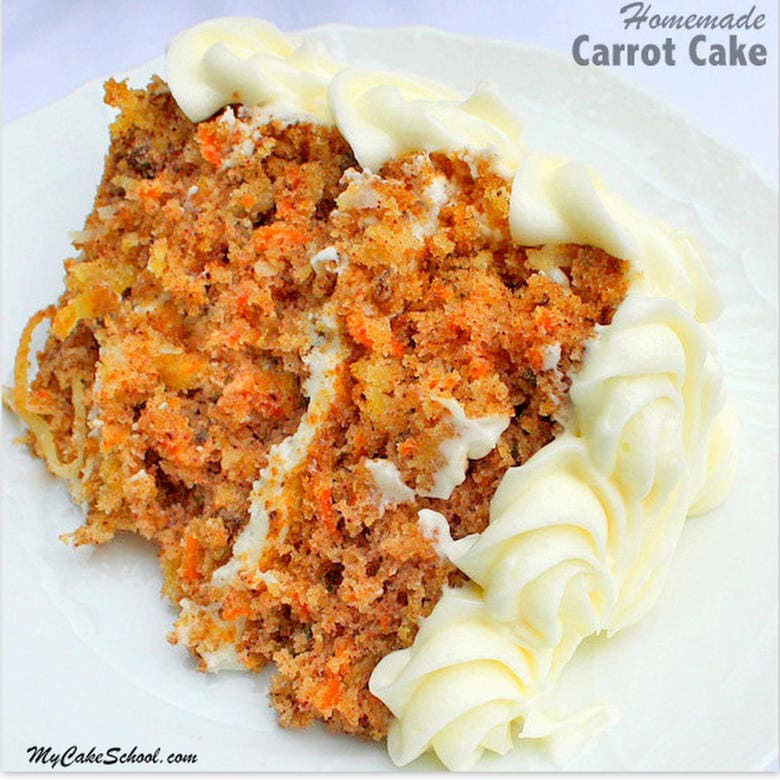 I guarantee that if you try this carrot cake recipe, you’ll come back to it again and again. It’s just that good! Don’t miss our full collection of tried and true favorite cake and frosting recipes in our Recipes Section! We also have a section of Free Cake Tutorials which include step by step photo tutorials and free cake video tutorials! Have you ever added raisins to this cake? I’m wondering if it would change the moisture level. I make it every year and always think afterwards to add raisins even tho it’s great the way it is. My whole family raves about it and usually the entire cake is gone. Hi Danielle, It is just personal preference that I have never made the recipe using raisins, though I think it would be fine to add 1/2 cup raisins. I would use golden raisins. I only have salted butter. Would I just not add any salt? Would sweetened coconut work? The recipe doesn’t specify. Hi Michele, Yes, sweetened coconut. I hope you enjoy the recipe.